I received my Case # from NVC on 3/8/19. Paid the fee on 3/9/19 and the status showed paid on 3/13/19. I have a question on filling I-864 EZ for affidavit of support. I haven't filed the tax return of 2018 (most recent tax year) yet. I will be filing the tax returns in 2-3 weeks and so I should be having the tax transcripts for 2018 before the visa interview. I have tax returns for 2016 and 2017. What should I answer for these questions in I-864 EZ? 5.a. Have you filed a Federal income tax return for each of the three most recent tax years? 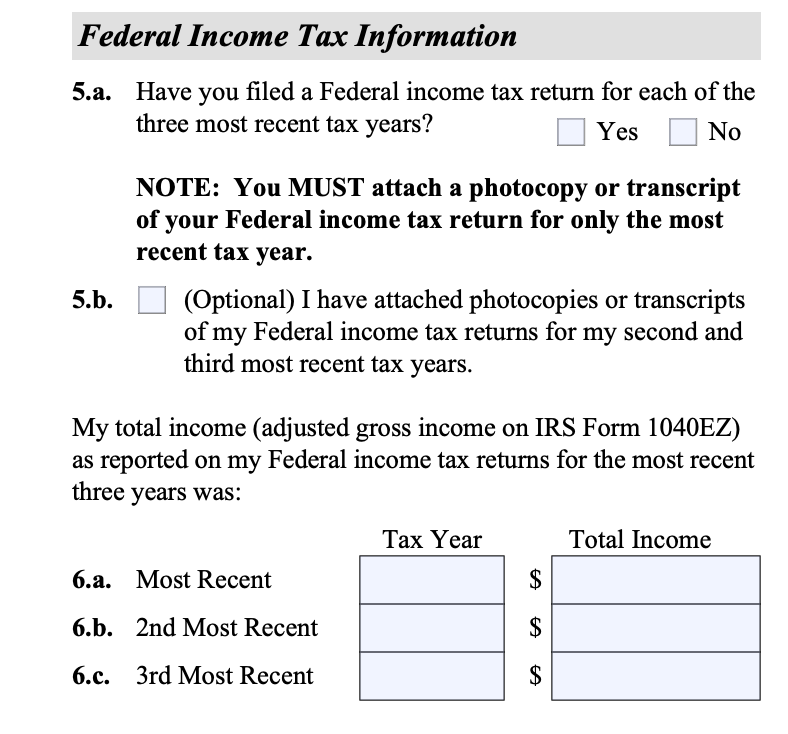 5.b I have attached photocopies or transcripts of my Federal income tax returns for my second and third most recent years. Answer: I am planning to have this checkbox checked. 6.a Total income for Most recent tax year (2018)? Answer: Should I enter 0 as I haven't filed the tax yet? Or should I enter the total income from W2 form? Then just pretend the most recent tax year is 2017. You don’t have to put 2018 numbers until after April 15th. 6a enter 2017 as most recent and 2016 and 2015. You haven’t filed 2018 so you don’t know what your adjusted gross income is for 2018, most definitely not 0 unless you didn’t work at all in 2018. Correct except the AGI, is not what is used UNLESS using the 1040EZ. Use the "total income" line. That's line 22 before 2018 and line 6 (is it?) for 2018.